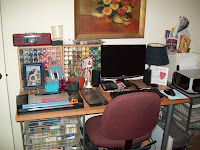 This desk is opposite my stamping desk and hold the new computer that my daughter and son-in law gave me for my birthday!! I'm loving it. 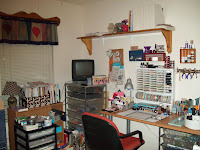 This also is the home to all of my acrylic paints that I used in my primative painting that I did prior to stamping. The floral picture above was painted by my mother years and years ago. She was quite talented and won a couple of blue ribbons in art shows. I wish she was still here to see the accomplishments of all of my talented daughters. All of my 8-1/2 x 11 paper is stored in this recovered mail box sorter that my son-in-law salvaged from a job he once had. 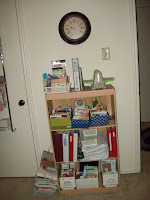 It certainly is a great way to store the cardstock (easy to see what you have and what you need). 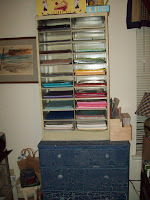 The little blue chest of drawers stores almost all of my holiday stamp sets (Christmas, Halloween, Thanksgiving, etc.). 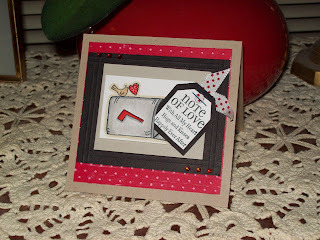 Right now I have all of my Valentine sets out. 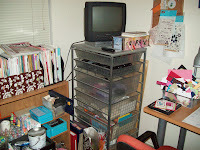 This is a better view of the cardstock storage .... isn't it GREAT!!!??? The bookcase holds all of my magazine storage above. The shelves are home to accessories and embellishments. In front of it I have a rolling 6-drawer storage for all of my 12x12 papers, chipboard die cuts, and other card elements. The divided space on top of it I use for my Stickles, glitter pens, 3-D paint bottles, various sizes of glue dots and other adhesives. Of course I have to have my TV in there. 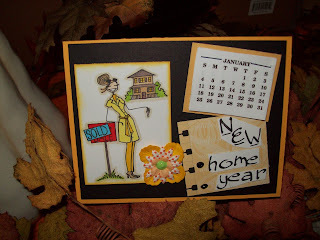 I do a lot of stamping late at night (or more like early in the morning) and have to have the "noise" and company of the TV. The wire drawer storage from The Container Store holds my Stamping Wheels in the top drawer, larger punches in the next two drawers, all types/sizes of envelopes, plastic bags, and presentation envelopes in the next drawer and the bottom stores all miscellaneous papers, embellishments, etc. 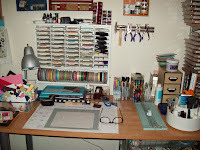 Okay, here is the REAL workspace -- my stamping space. The storage above holds all of my SU inkpads, Versamark pads, and Stazon pads. I have a few of my ribbons on the dowel rod below; however, I'm such a ribbon hoarder, that I've had to expand on that storage (more to come). I have the small square Pallette pads at the top of my deskpad. And at the very top of my desk are my watercolor pencils, chalks, WWC Crayons, Prismas. The little 3-drawer check holds all of my tiny punches. The round turning thingy holds various decorative scissors, rulers, paper piercing tools, craft knife, stampler, crystal effects, and other smaller things that fit into this perfect storage tool from Pampered Chef. Okay, here are my stamp sets. I have a Dymo labeler that I use to label all of the ends of each box. At one time, I tried organizing them by Floral/Kids/Nature/etc (much like SU's catalog, but that did not work out as some of them are in large boxes than my space would hold and it made it very hard to read. So I then sorted them my size of the box as it made it much easier!! I generally keep the seldom used sets on the top shelf and work my way down. 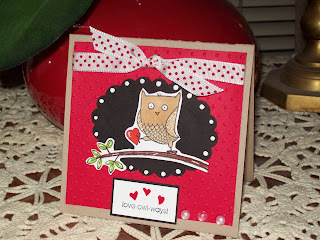 I do try to keep all of my sentiment sets in one place. 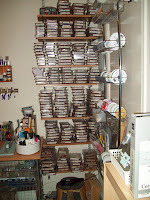 The bottom shelf is mainly stamps from other companies (AMuse, Inkadinkado, Stampendous, Papertrey, etc.) I love them ALL!! I bought this over-the-door storage for my "other company" stamps; however, one side of the thing kept slipping out of the hanger. 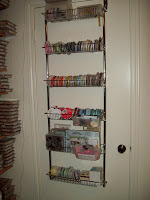 I emptied the shelves, glued the arm that kept slipping out together and replaced the stamps with ribbons. I've tried to group them by colors (reds, greens, blues, etc.). I'm enjoying having them all together. 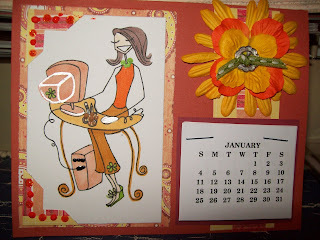 One of my daughters was over this past week-end and picked out some ribbon which served as inspiration for the colors on the card she was making which makes perfect sense to me. This little shelf hold some printed tutorials on the middle shelf; all of the cards I've made and not mailed out on the first and bottom shelf; and my Cuttlebug, embossing folders, and a few accessories (tags, small envelopes, etc.). 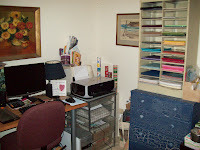 This is the view of my craft room when you enter from the small hallway. I feel very lucky to have this space devoted to something I love to do. I live in a small two bedroom, two bath half-duplex. Some other time, I'll post pictures of little piece of heaven. This little old lady certainly enjoys every inch of my home!! I'm glad I could share this with you and hope you'll come back and visit with me again very soon!